In the blog post "Draped ceiling transforms gym from drab to dramatic", brightly colored poly deco mesh and twinkling white lights were used to create a dramatic ceiling for a large space. 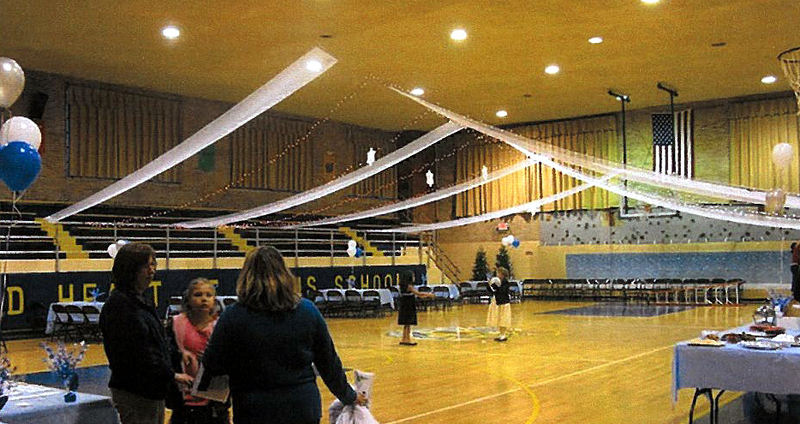 This false ceiling helped to transform a plain school gym into an extraordinary space for a special event. After a few requests for more specific directions, I am posting the tutorial here. Sorry it took so long to get the specifics into a post. Here are some basic descriptions of how we created this fun draped ceiling. I also included answers to some of the question we received. Please feel free to comment with additional questions if the description or instructions are not clear. How much poly deco mesh will you need for the draped ceiling? The false ceiling is created with 21" wide rolls of poly deco mesh and strands of white lights. A roll of deco poly mesh is 10 yards(30 feet) long. The quantity of lights and deco poly mesh that you will need is largely dependant on your particular event and location. It will depend on the size of the space you want to cover and how many rows of lights and deco mesh you want to install. In past projects, like the one pictured below, a false ceiling was created but on a smaller scale. In both versions pictured here the false ceiling extends out 10 yards or 30 feet (1 roll of deco poly mesh) on each side making it 60 feet wide total. This event was the first time that the false ceiling was created in the gym. Here they used 4 rows of deco poly mesh and lights down each side (8 rolls total). For this event, twice as many deco mesh rolls, 8 rolls per side (16 total) and lights were used. The effect is more dramatic, but more work. So the basic supplies you will need largely depends on the look you want to achieve and the space you want to cover. If you use the method described here, the draped ceiling will always be approximately 60 feet wide, but how far front to back you want to cover, largely depends on you. The rigging for the drape was basic steel cable. The one pictured here is from Ace Hardware . Your local hardware store sells this and usually you can purchase it by the foot. 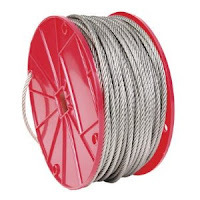 I would recommend getting some assistance at the hardware store with a recommended cable weight depending on the length and weight your cable needs to hold. The mesh and lights are not heavy, but better safe than sorry. We ran three cables the length of the gym so you will need enough cable for your gym length x 3 (for the three cables) plus extra length for hoisting. We used clamps (will need 6 total) on the ends to secure the three cables into eye bolts (6 total) that were anchored in the walls. One cable ran higher in the center. Two lower cables ran on each side. Each of these wires was approximately 28-30 feet out from the center. Make sure to anchor the eye bolts very well into the wall. Our bolts were cemented into the wall days in advance to make sure they were very secure. For some great photos and tips on wire cable, clamps and eye bolts see this blog post, My friend wire rope on Modern in MN. We laid out the 3 cables down the gym floor below where they would be raised. The cables ran the length of the gym (in the center and two sides). Leave extra length on each end of the cables so you will be able to hoist it up once it is done. The deco mesh comes in 10 yard rolls that are rolled on a small cardboard tube. The dimensions of our gym enabled us to use one deco mesh roll per side of the drape (10 yards.) The deco mesh is loosely attached to a cardboard roll on the end (reinforce this with added glue). We glued another tube to the beginning of the roll. You could use small PVC pipe or mailing tubes. So now each roll of deco mesh has two rolls attached, one a the beginning and one at the end (like a scroll). We used these pipes/rolls to attach the deco mesh to the wire by threading the cardboard tubes along the center wire. Alternate deco mesh going toward one side and the next one running toward the other side. Use as many rolls of deco mesh as you want to achieve your desired result of covering the ceiling (see photos above). After the tubes were threaded on the center wire we threaded the other ends/sides onto the side wires. This is all done while the wire is on the floor. Next we added the white twinkle lights. We used standard white Christmas tree style lights that ran the length of the deco mesh. We used one long piece (can be multiple strands connected) to run from one side of the wire, up and over the center wire and back down to the other end. Continue laying out the lights like this across the length of the wires. Once everything is hoisted up, you will need to run extension cords to light these so keep this in mind. Make sure you have access to electrical outlets. Be careful to string only the recommended number of lights together or you will blow the fuses on the strands (a problem we had the first year). Using LED lights will also alleviate this problem. Please NOTE: Before you finish and hoist the lines up, make sure to test the lights. It is a lot easier to fix problems on the floor than when the lights are in the air. With everything in place and still on the floor, use zip ties, wire or something comparable to secure the cardboard tubes and light strands in place on the wire. This keeps the tubes and lights from sliding or bunch when you hoist the wire line into the air. Once all this was complete, we threaded the ends of the wire cable through the eye bolts secured in the wall and hoisted up the wire to the height we wanted. With a little man power the cables were held in place and the ends secured with a clamp. We hoisted the two lower sides, then the taller center. You may need a tall extension ladder to get up high enough to elevate your center line. Arrange the extension cords for your lights, taping down any cords that may be a tripping hazard. One of our side wire lines ran the length of the bleachers so we hid the extension cords along the bleachers. An added bonus: the poly mesh decorations and wire rigging can be used again for other events. We saved ours after the event and plan to use it again in the future. 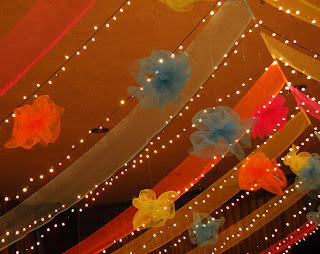 With about $100 worth of poly deco mesh rolls, you can create this fun false ceiling for any event. This inexpensive draped ceiling treatment would be the perfect for a school prom or dance. It creates a big impact with a small budget. I hope this tutorial was helpful and answered some of the questions. Feel free to post additional questions here and we will try to answer them. did you drill into walls to install the eyebolts for the wiring? some venue would not allow you to damage their wall. is there a way to install anchor/eyebolts for the wiring system? Yes, we did drill into the wall and set anchors. This was at the school gym and we recreate this look for lots of events so permanent anchors was the best choice. As for other options. We have anchored the side wire onto the bleacher banister on one side. If you can find something linear to run to that would be your best solution. I hope that makes sense. If you need more help- email me at ideas(at)mardigrasout.com and I can try to help.